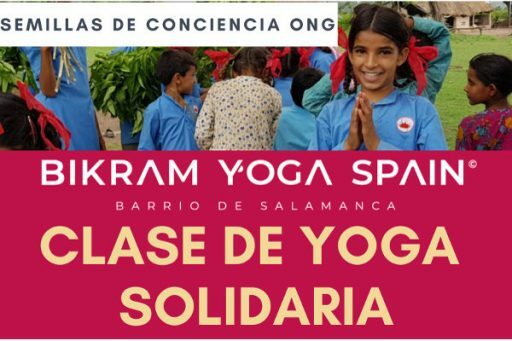 Enjoy a Bikram Yoga class taught by the Master and Founder of Bikram Yoga Spain, plus with your contribution * you will be helping the most underprivileged children of India. * Minimum contribution of € 10 to be paid before the class. All the funds raised will be allocated in full to the NGO Semillas de Conciencia, which helps the most disadvantaged children in India. Learn more about your project here . We are waiting for you on February 17 at 5:00 p.m. in the center of Barrio de Salamanca, C / Maldonado, 52, Madrid, Diego de León metro. What will you find in this Bikram Yoga class? You will practice Yoga in our acclimatized room that reproduces the climatic conditions of India (40ºC of heat and 40% of humidity approx) reproducing 26 postures of Hatha Yoga arranged in a perfect sequence that will flow all your energy from one end to another of the body and balance body and mind. You will be surprised by the class! . If you are new, read these guidelines for your first class.